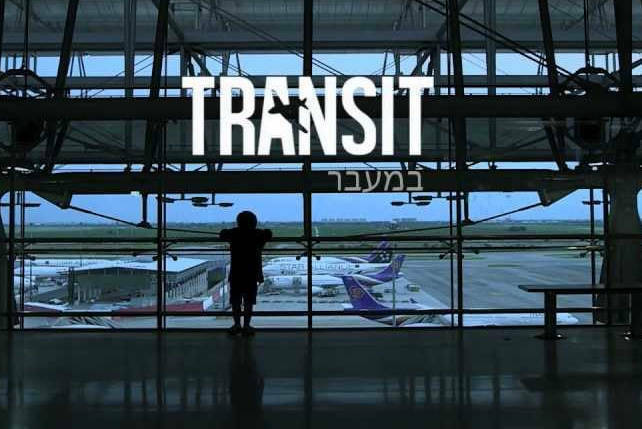 This week: a tribute to Lou Reed, Urbandub, 6CycleMind, and more! Why you should go: Another record label which houses kickass bands are celebrating their night! 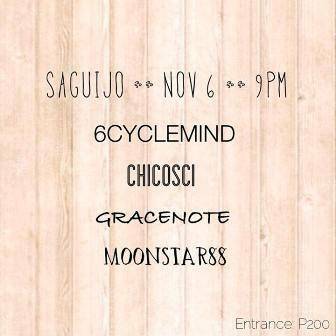 Soupstar entertainment will be bringing you their best acts -- 6CycleMind, Chicosci, Gracenote, and Moonstar88 -- in this jam fest. Other details: Gig starts 9 p.m. Door charge at P200, inclusive of one drink. Why you should go: If you don’t know Mae, then this is a good opportunity to know the band when several indie artists interpret the most memorable songs from Dave Elkins and the rest of the boys. 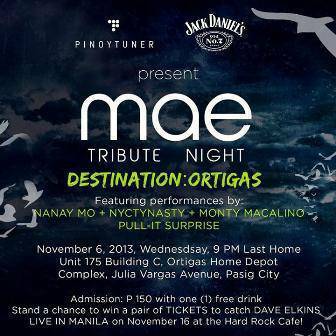 Plus, you also get the chance to win a pair of Dave Elkins Live in Manila tickets! 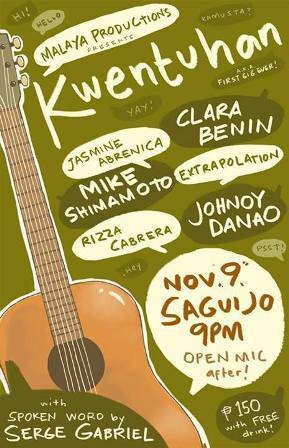 Other details: Jamming starts at 9 p.m. P150 entrance fee, inclusive of one drink. 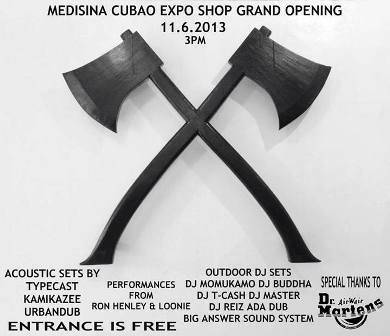 Why you should go: Typecast, Kamikazee, and Urbandub are performing live at Medisina’s opening! Fliptop legends Ron Henley and Loonie will also be gracing the event. Plus, DJs will be playing music all night so the party never stops. Other details: Performances start by 3 p.m. And all of these artists for your listening pleasure... all for free! Why you should go: Don’t miss out on any of Radio Republic’s free gigs this month! 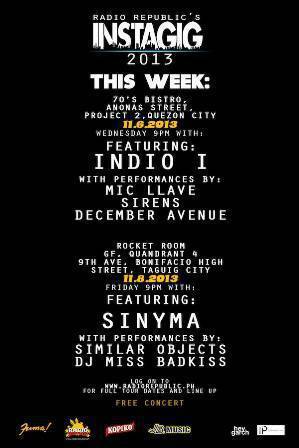 To kick things off this month, Indio I will be headlining the gig at 70s Bistro! Other details: Instagig starts by 9 p.m. Free entrance, as usual! 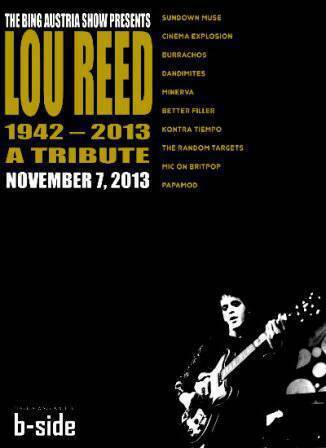 Why you should go: Pinoy artists give tribute to the late Lou Reed of the Velvet Underground fame. Watch Sundown Muse, Cinema Explosion, Minerva, Kontra Tiempo, and more, play their rendition of his greatest hits. Other details: Event starts 9 p.m.
Why you should go: Don't pass up on this chance to see the Kinaiya band play alongside live art performances, including a shadow play act! Other details: Event starts 8 p.m. P200 door charge with P100 consumable. Why you should go: Get ready for another open mic night! Feel like a start because Johnoy Danao, Extrapolation, Clara Benin and more awesome artists will be opening for you! What's more, Serge Gabriel will be having a spoken word performance. Will those be enough to prep you up? Other details: Gig starts 9 p.m. P150 gets you in with a free drink! Why you should go: Learn to beatbox from the master! 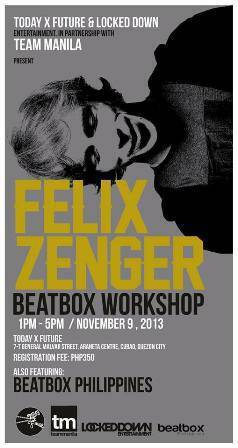 All the way from Finland, Felix Zenger visits Manila to teach his techniques in this one-day workshop. Then later, watch his exclusive performance with supporting local acts RBTO, Tarsius, Supreme Fist, and Beatbox Philippines! Other details: Workshop starts at 1 p.m. All participants must pay a P350 registration fee. If you just want to watch the performance, drop by at 9 p.m. Entrance is absolutely for free! Why you should go: Time to bring out those mixtapes! 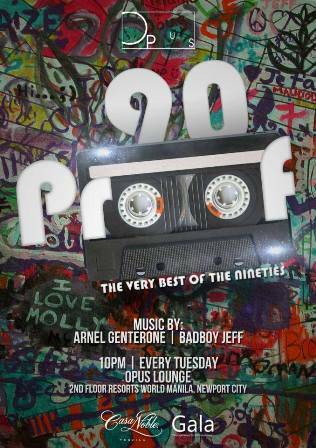 The very best of 90s music come to life every Tuesday at Opus with DJs Arnel Genterone and Badboy Geff on rotation.